Despite the obvious confluence of concerns between psychodynamic psychology and the emerging field of consciousness studies, the extent to which psychodynamic thinking has factored into the consciousness literature has been limited. With widespread interest in “the unconscious” having significantly diminished, the present paper asks what might be implied in the shift towards the notion of “consciousness”—what about this cross-disciplinary designation has come to attract attention not only within the academic world, but also in the popular press? That the term does indeed invite contributions from a variety of disciplines makes the field both a meeting space, and a battleground. 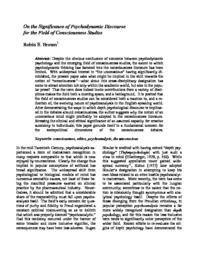 It is posited that the field of consciousness studies can be considered both a reaction to, and a reflection of, the evolving nature of psychoanalysis in the English-speaking world. After demonstrating the ways in which depth psychological discourse is implicated in the debates around consciousness, the author suggests why the notion of an unconscious mind might profitably be adopted in the consciousness literature. Stressing the clinical and ethical significance of an assumed capacity for creative autonomy in individuals, this paper grounds itself in a fundamental concern for the sociopolitical dimensions of the consciousness debates.